Most of us have been using Apple’s built-in Maps app to help us navigate the world in which we live. We have found it to be a very accurate, reliable, time-saving and beautiful application. Now they have taken the technology a step further by starting to include maps of indoor structures. Today you can find a selection of airports and malls already mapped. As a business IT services company, Network Coverage is constantly traveling to new locations, sometimes in large complexes or complicated building layouts. With indoor mapping, we are able to save time and be sure we are in the right place when meeting our clients. Don’t you wish your iPhone had a way to let people texting you know that you are driving? Good news! Now there is in iOS 11. When your phone is connected to your car’s Bluetooth or CarPlay system and detects motion, it can automatically suspend alerts and tell people you are driving and will get back to them when you reach your destination. At Network Coverage we encourage safe driving and this feature is a great asset for that! Learn more about how to use the Do Not Disturb While Driving feature here. 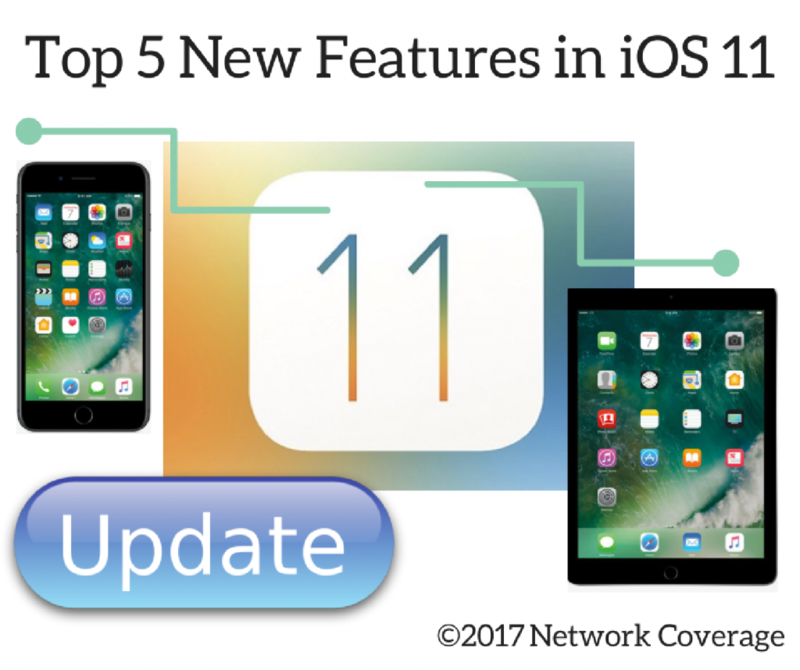 Other huge improvements introduced in iOS 11 include new video and image file formats allowing for more space on your device. Let’s talk about photos first. We take a lot of photos with our iPhones and iPads. There was a study done by the U.K. telecom company O2 in 2013 that stated that the average user took about 7 photos per day. If you do the math, that’s 2,555 photos per year. With the average photo taking up around 5 megabytes of space on your phone, at the end of the year you will have added 12 gigabytes to your phone. That’s a lot of data to store on a base 16GB iPhone! The previous versions of IOS used JPEG as the file format. The new format introduced by Apple is called HEIF (High Efficiency Image Format). This new format will take that 12 gigabytes of photo data and cut it in half to 6 gigabytes while keeping the quality the same (according to Apple). For us shutterbugs, this will likely be the feature we use the most and never think about. Apple has done the same with the video format, changing to the new H.265 (HEVC – High Efficiency Video Codec) standard with similar space savings. If you tie this in with iCloud Photos you will also save some money on your monthly subscription cost by using less space. Coming this fall sending cash to your friends, family, and coworkers will be as easy as sending an iMessage. Apple Pay has been great for making purchases and is so fast it has become a default payment method around the office. Now Apple is releasing PayCash, a way for you to send money via iMessage. Apple gives you a virtual cash card that sits in your iPhone and you can use it to pay for things just like a gift card. If you just want the cold hard cash, transfer it right to your bank account. This is great when a coworker pays for your lunch because he decided to go to a cash only restaurant. Now you can pay him back electronically before you even finish the meal. Want to buy something from a friend but don’t have the cash? PayCash to the rescue! I think this will be a highly used feature of iOS 11. The Notes app in iOS 11 now has a document scanning feature that is pretty slick. You simply click the “+” sign in a note, select “Scan Documents”, then when the camera comes up take the photo and you’re done! The great thing here is it will automatically detect the document at odd angles as well as head on. When it takes the photo at a skewed angle it can turn that into a perfectly straight and proper document as if it was a direct scan. You have to try it out for yourself to experience how great it really is. They also give you filters and adjustments to correct any errors in the scan. While the results are not perfect every time, We think you’ll agree that this function paired with iCloud just made the copier in the office obsolete. Pair it with iCloud and you’ll have your document everywhere you need it in just a few seconds. These are only five of the many reasons why you will love the new update for iOS 11. Just looking at the tools Apple developed and shipped for augmented reality (or AR) this year gives us a sneak peek at what the future of computing will bring. Developers now have the tools to build immersive virtual worlds that lay atop our own. That alone has the potential to build a new landscape for entertainment and business technology that the team at Network Coverage is very excited for. So far, we’ve seen some pretty cool stuff in this space, but when we look back 10 years from now at what people have built today in its infancy, this will seem like a 1980s Super Mario game seems today next to things like Crysis 3. Keep an eye out here at Network Coverage for more Apple news and hints and be sure to stay connected and informed in the business and tech industries with our latest blog posts!